Abandoned carts are one of the most maddening parts of running an e-commerce business. You’re so close to making a sale--the items are in the cart--and then, at the last possible moment, the customer leaves your website without buying anything. Abandoned shopping carts are one of the most frustrating issues e-commerce shop owners have to deal with. Someone comes to your site, finds a product they want, adds the product to their shopping cart, and then leaves without checking out. Sometimes, shoppers will even begin the checkout process, entering shipping or billing information, but bouncing before getting to the final step of submitting the order. Those are abandoned carts, and they happen more often than you might think. Almost 70 percent of carts are abandoned, accounting for millions of dollars in lost potential revenue each day. Here’s some quick math. At a 70 percent abandonment rate, if your store processes 100 orders a month, that means there are about 230 abandoned carts that never make it to checkout. At, say, $50 per order, that’s $11,500 in lost sales. If you could recover even 15 percent of those carts, that would be an extra $1,725 in your pocket. And you can. A 15 percent recovery rate is absolutely reasonable. In this article, we’ll examine the primary reasons why people abandon their carts, techniques to reduce how frequently this happens on your site, and how to use cart abandonment emails to recover and convert some of those lost customers into sales. TIP: Learn how shopping cart software can help increase your e-commerce conversions in 2019. And here are the results of a similar study from Statista. From those two studies, we see some clear trends. Things like shipping charges and other unexpected costs, slow shipping times, cumbersome checkouts, website problems, and trust issues emerge as major causes of cart abandonment. Fortunately, there are ways to mitigate all of these potential roadblocks. While some level of shopping cart abandonment is unavoidable, there are things your business can do to reduce the abandonment rate. The best way to solve your abandoned cart problem is for your customers to simply stop abandoning their carts. The top cause of cart abandonment in both studies--by something of a landslide--is shipping charges. And, on top of that, people also abandon carts because of other charges that might surprise them at checkout, like taxes or fees. The easiest fix, of course, is for your business to just eat the cost of shipping and tax. If you go that route, be sure that your site makes it clear that the price of the products is the “all-in” price; if you’re selling something for $40, it’s going to cost exactly $40. You also need to make sure you have the margins to support offering free shipping. You can’t overcome zero margins with more volume! Unfortunately, free shipping and no tax isn’t a reality for most businesses. In that case, your best approach is to be very clear and upfront about all of the additional costs someone will face at checkout time. Put your shipping rates right on the product landing page, and mention if there will be an internet sales tax or other fees. It’s clear from both of the studies above that people don’t like to be surprised. Beyond unexpected shipping costs or other fees, look at some of the other related reasons for cart abandonment: “I couldn’t see/calculate the total order cost upfront.” “Returns policy wasn’t satisfactory.” “Discount code doesn’t work.” All those issues can be resolved with clear communication so there are no surprises once a person has started the checkout process. 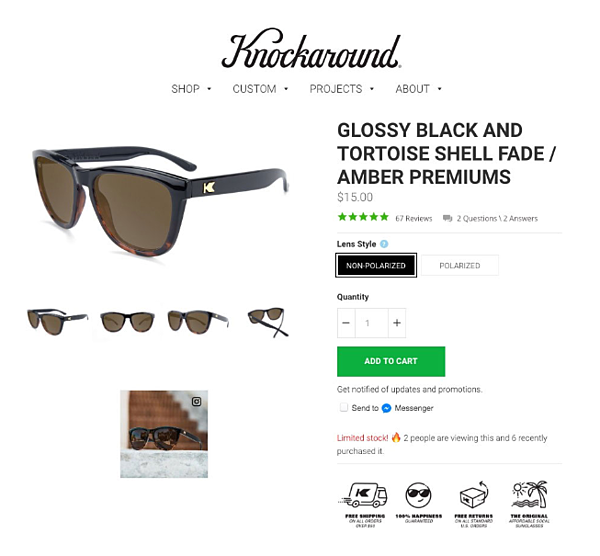 Here’s how Knockaround does a good job to eliminate surprises. They clearly communicate on every product page their shipping costs (free over $50) and return policies (satisfaction guaranteed and free returns). Amazon has conditioned us to expect our purchase to come in two days flat. (They’ve also somehow made us all forget we’re paying $120/year for that perk.) But even if we weren’t all brainwashed into thinking two-day shipping is a right, not a privilege, when we order something online, we want it NOW. The solution is probably pretty obvious: Offer express shipping. But you don’t have to offer it for free. Studies show that people who want express shipping are willing to pay for it. Even better, they’re motivated by it: more than 40 percent of people say the option for same-day or next-day shipping would make them more likely to buy something. If you can swing it, offer a free shipping option that’s slower, and a paid express shipping option that’s faster. That should satisfy everyone who would be tempted to abandon a cart over any shipping issue. Cultures for Health does tiered shipping well. They prominently offer a flat rate of $5.99 for economy shipping on smaller orders, free economy shipping on orders over $40, and then clearly communicated faster options for a fee. Forcing someone to create an account before they can check out is a significant roadblock. One-third of people in the Baymard Institute study abandoned their cart over account creation and, anecdotally, think of how many times you’ve done it. I know I have. A long checkout process is also a good way to lose customers. The average checkout contains 23.5 form elements, but the ideal number is 12 to 14. And a study by Pymnts.com found the top performing e-commerce sites all have shorter-than-average checkout times, which can’t be a coincidence. Of course, getting customers to sign up for an account has a lot of benefits for both you as a merchant, and for the customer. That’s why you should always offer a guest checkout option--and then give them the option to create an account once the person has entered their information or even completed their purchase. Beyond offering guest checkout, there are a number of steps you can take to make your checkout process smoother. Try to reduce the number of things you’re asking someone to type. For example, once they enter their billing address, make sure they can click a button to use it to autofill their shipping address. Can you auto-suggest their city and state once you have their zip code? Do you really need their phone number? Try to keep the checkout on a single page and, if that’s not possible, show people their progress as they complete different stages of the checkout process. Offer popular digital wallet options like PayPal, Google Pay, or Amazon Pay that saves people the hassle of having to enter all of their credit card details. Talk to your existing customers to find out which payment gateways are most popular with them. Set up a one-click checkout for repeat customers. This is one of the major benefits of creating an account for the customer. Retargeting on social media. Using retargeting tactics on popular social media channels can help bring customers back to complete their checkout. Many brands have turned to Facebook chatbots for following up with those who have left without finalizing their order. Send cart abandonment emails. Unfortunately, there’s no way to get your cart abandonment rate down to zero. But not all those abandoned sales are lost. One of the most effective ways to save abandoned carts is by sending cart abandonment emails. More on this later. Bellroy has a fantastic checkout process on their site. It’s all on one page where the customer sees everything they’ll have to fill in--and they’ve done a great job paring down the form. The shipping choices are concise. There’s an option to use the shipping address as the billing address. The payment options are simple, and the PayPal availability saves people the trouble of having to type in their credit card number. This is a checkout page worth emulating. An e-commerce site that’s hard to use is going to lose customers quick--whether it’s difficult to navigate, features broken links, or spits out unexpected errors during checkout. It’s important to test your site’s usability on a regular basis. Go to your own website and try to find a product, then buy it. Or have a friend do it (bonus points if they’re not so web-savvy). Stay vigilant about broken links and make sure your search is working like it’s supposed to. Check out the focus on usability here by the store Skinny Ties. Their navigation bar offers direct links to the primary ways someone would search for a tie (color, width, pattern, and so on). Below that, they’ve got another navigation system--a unique and highly clickable one where pictures of different types of ties link to sections of the site. And if neither of those works for you, there’s a search box up top--and a section of “popular” ties on the bottom. This site’s design is entirely focused on getting customers to the exact product they want as easily as possible. It’s also crucial to give your site a stress test on mobile. Mobile has higher cart abandonment rates than desktops. Make sure your site is mobile-optimized, fast, accepts digital wallets, and limits screen-blocking pop-ups. You need to make sure your site has a credible look and feel so people will be willing to give you their home address, email, and especially credit card info. Make sure your SSL is up to date (so that nice little lock shows up next to the URL in the person’s web browser) and use trusted payment processors and badges. One other way to show you’re trustworthy is to offer a live chat with a real person. And make it clear it’s a real person by including their picture, their name, and maybe even a link to their Twitter account. So… what happens when you take all of those steps above and people still abandon their carts? Sadly, it’s going to happen. That’s where cart abandonment emails come in. The average recovery rate for everyone using our standard cart abandonment emails at Jilt is 12 percent, and with a few tweaks to the default content, we see stores get that number up to 15 and even 20 percent. For logged in customers, you’ll already have their email. Entered during the checkout process (even if the cart is abandoned). Capturing the email address earlier, with a pop-up or by enticing the person to subscribe to your list. Send an email within an hour or two of the abandonment, asking what went wrong. Send a second email within 24 hours, reminding the person what’s in their cart and potentially offering a discount. Send a third and final email within 48 hours, creating a sense of urgency or scarcity. Abandoned carts represent lots of potential revenue for your store, so by addressing them from two angles--site optimization and cart abandonment recovery emails--you should be able to get back a good chunk of sales you’d otherwise never see. Ready to learn more about increasing your e-commerce sales in 2019? Learn about two popular forms of online retail marketing, omnichannel marketing and multi-channel marketing, and how they can be used for any online store. 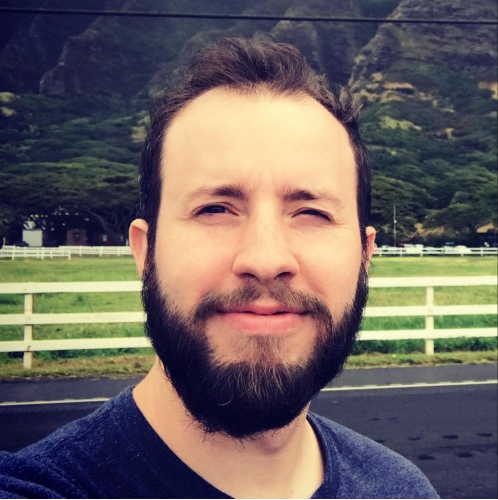 Max Rice is the co-founder and CEO of e-Commerce email marketing platform Jilt. He started his career in e-Commerce over a decade ago and writes regularly about running an online store on the Jilt blog.